When I went to see Sherlock Holmes: A Game of Shadows at my local theater recently I found myself quite irritated as I gazed up at the theater marquis, which advertised the film as “Homes 2.” Come now, I thought, I know not everyone is a Sherlock Holmes fan like me, but certainly the character is mainstream enough that even the teenage part-timers working at this theater would know the correct spelling of his name. As I walked out of the theater about two hours later, I looked at the marquis again, and I found that now the spelling error bothered me much, much less. Whoever this “Homes” guy was, if he wanted this movie, he could have it. 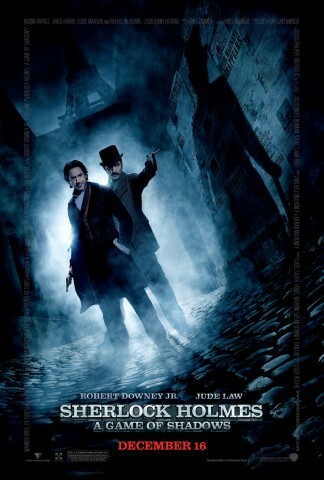 Sadly, though, Sherlock Holmes: A Game of Shadows is technically now and forever a Sherlock Holmes movie: the generically subtitled sequel to Warner Brothers’ initial, game attempt to make a viable mainstream film franchise out of one of popular culture’s most enduring creations. For the record, I enjoyed the first film two years ago despite some initial consternation, because besides being enjoyable, if not especially great, it remained tethered to most of what Sherlock Holmes was fundamentally about. It may have had chase scenes, fight scenes, explosions, and computer generated effects, but in the end it was still about the master detective, with all of his unique personality quirks and with his friend and ally Dr. Watson in tow, figuring out a complex and inexplicable mystery (if one that had significantly more at stake than the manor house murders that were the literary Holmes’s part and parcel). Granted, there was never any doubt whodunit (it was a villainous Mark Strong, in fine glower), but how he-done-it was nevertheless intriguing enough to string the action along. Now, on the other hand, with Game of Shadows, this burgeoning series has completely untethered itself from the identity of Sherlock Holmes, instead turning their version of the character into a kind of bizarre, steampunk James Bond. And rather literally, at that. Holmes. 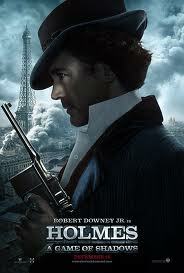 Sherlock Holmes. (He likes his cocaine injected, not snorted). 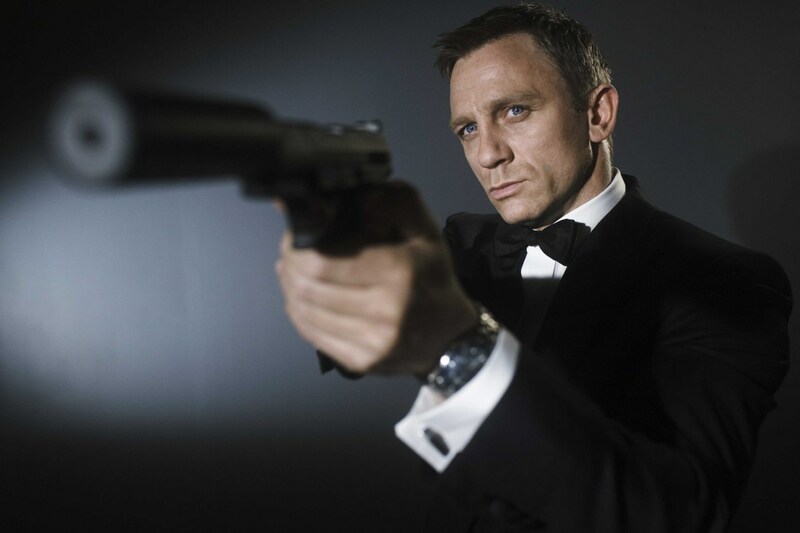 James Bond (Daniel Craig): not the world's greatest detective. In Game of Shadows, the plot uncoils thusly: Holmes meets his paramour Irene Adler and arranges a rendezvous with her. Unfortunately, she is in the employ of the villainous Professor Moriarty who, feeling betrayed by her affection for his enemy, murders her to send a message to Holmes. Holmes then meets the Professor and his henchman, Colonel Sebastian Moran, in a social context, where Moriarty “encourages” Holmes to not get in his way. Saving Watson from a Moriarty reprisal, Holmes then pursues the criminal to Paris, where he recruits as an ally a formidable gypsy woman named Simza, whose brother, against her wishes, has been lured into Moriarty’s employ. He discovers part of Moriarty’s evil, epic-scale plot, and well, I don’t want to venture too far into the realm of spoilers, but let’s just say that the story does eventually take Holmes and Moriarty to a final confrontation that happens to be in the vicinity of the Falls of Reichenbach. In between all of this, the long suffering Watson finally marries his fiancé, Mary Marston, much to the chagrin of Holmes, but of course, the good doctor and his new wife become a pawn in the deadly game between the detective and the professor. It seems likely that whomever conceived this movie might have read Eco’s essay, as besides following rather closely the Bond formula, it stages Holmes and Moriarty’s next-to-penultimate conflict is turned into, quite literally, a chess game. The script, flawed as it is, isn’t brainless, as there’s plenty of clever little Mcguffins, set-ups, and pay-offs, but the film never reaches the level of being consistently entertaining, compelling, and in most cases feels rather trying. The main character simply isn’t Holmes anymore, and this isn’t a Sherlock Holmes story; only once in the film, in fact, does he even refer to himself as a detective or Moriarty a criminal. Here Holmes isn’t about reaching a brilliant deduction as much as he is about laying out a master con while fighting and shooting his way out of all kinds of danger. Now I’m always for judging a film based on what it is rather than what I think it should be, and if what it is an anachronistic James Bond movie, then fine. I like James Bond movies (good ones, anyway). It remains, though, that this still isn’t a very good one. 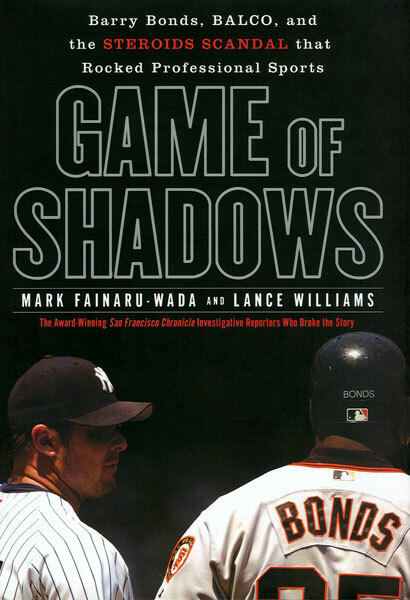 Of course, I suppose it could have been worse: it might have been about Holmes and Watson investigating the BALCO scandal. Part of the problem, of course, is that just as Sherlock Holmes is usually the only character that can pull off a Sherlock Holmes story, one needs James Bond to tell a James Bond story. Bond, for better or worse, is a singular creation: a gorgeous misogynistic masculine demigod fighting for all the good reasons with all the right tools yet all the worst impulses. But despite being a “blunt instrument” compared to Holmes’s analytical thinking machine, he’s actually far more vital to the success of his formula than his formula is; swap him out with this film’s unpleasant, manic weirdo and it all pretty much falls apart. Not even the real Sherlock Holmes, master of disguise that he was, could have pulled off something like James Bond, and here his equivalent doesn’t even try. Sherlock Holmes is not James Bond. Nope. No sir. Not even a little bit. It has seemed impossible the last few years for Robert Downey Jr. to really ever do any wrong; for whatever, he’s acquired that uncanny talent to be good even when his material is bad. Even he, though, has precious little to work with here, being given a Holmes that has gone a few too many ticks past the charming eccentric of the last film toward someone who can be downright unpleasant. Jude Law, on the other hand, is more less what he is as Watson, and that’s someone who has to try to appear tough while firing a gun or throwing a punch. At that, he’s more successful than one would expect. Since Rachel McAdams, who was one of the true bright spots of the last film, is taken from us far too soon, the role of Simza, or Girl B, so to speak, goes to Roomi Napace. The beautiful Napace, internationally famous for playing the first Lisbeth Salander in the original The Girl With the Dragon Tattoo, makes her English language debut here, and she truly could not have asked for a more thankless role. Since Watson is spoken for and Holmes proves aromantic (if platonically obsessed with the good doctor), her character is stuck either playing third wheel to their raging bromance or providing support for some ancillary action scenes. 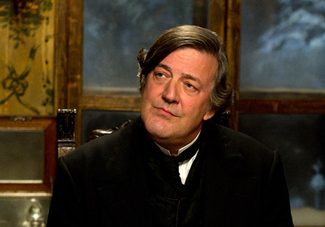 Also new this time around is the usually very talented Stephen Fry as Holmes’s brother Mycroft, here essentially playing the part of James Bond’s M, if M took to walking around onscreen naked for no other reason that someone thought it would be funny. It wasn’t. At all. In "Sherlock Holmes: A Game of Shadows," you get to see this man almost entirely naked. Enough said. The real casting disappointment, it must be said, comes with Jared Harris, son of the great Richard Harris, in the very crucial role of Moriarty. As anyone who has viewed Harris on Mad Men would know, the man’s a fine actor, but entirely ill suited to play the iconic “Napoleon of Crime.” The Holmes-Moriarty dichotomy has through the years taken on a life far larger than anything Conan Doyle could have intended (of which the filmmakers were well aware, having teased the character for much of the first film). Essentially, the pairing is not unlike a world heavyweight title fight between two master intellects with larger-than-life personas. Here, being placed against the star power and peerless acting that Downey Jr. makes look so effortless, Harris is clearly performing far too high above his own weight class; he frankly even lacks the ingrained menace, seething duplicity, or customary recherché to be a run-of-the-mill Bond villain. 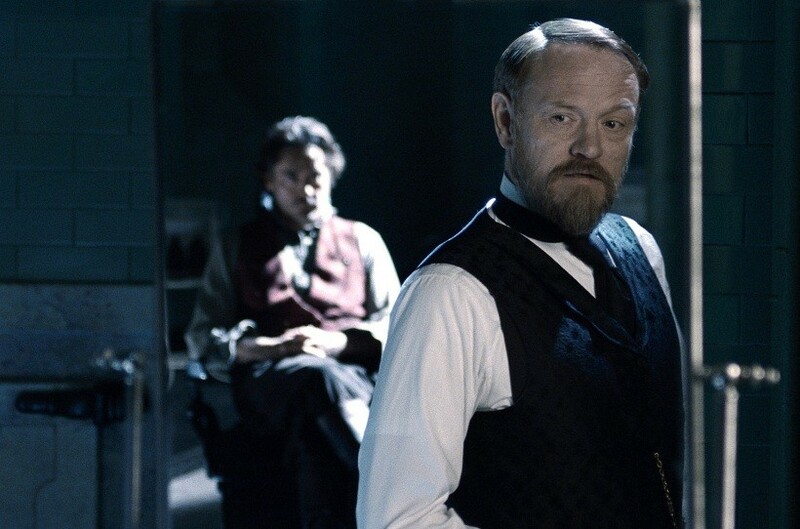 Jared Harris's underwhelming Professor Moriarty simply can't match up, in either performance or charisma, with Downey's Holmes. But casting is only part of the problem in Game of Shadows. As unfortunately happens when a fair but flawed movie is successful enough to merit a sequel, its creators egotistically embellish everything that they themselves added to it, whether their original ideas were actually any good or not. [i] In this case, the added emphasis on action that complemented the first movie, supported by Guy Ritchie’s signature style, proves here to be overdone. Some sequences work, such as the moments where we revisit Holmes’s ability to analyze a fight before he starts one, and some, like a chase scene through an exploding forest done in bullet-time, do not. Ritchie even continues the obnoxious decision from the first movie of letting everything in the film’s world look unappealingly gray and colorless. Given that the first installment took place entirely in late Victorian London, I could at least understand it if not like it; but since most of the story here is set on the European continent, it feels entirely unjustified. Hell, the filmmakers even make Switzerland appear ashen and lifeless. SWITZERLAND. Looking back as I did recently on the incarnations of Sherlock Holmes through the years, one thing that did become clear to me was just how badly in need of rejuvenation the character had been for most of the last two decades (and before Casino Royale, you could have absolutely said the same thing about James Bond[ii]). In retrospect, then, I almost grew to appreciate the previous film more with hindsight for trying to give literature’s greatest detective something of a makeover as he marched onward into the 21st century. Sherlock Holmes: A Game of Shadows, though, is just a colossal, and perhaps irredeemable, stumble in the wrong direction, away from what makes Sherlock Holmes so timeless, and full-throttle toward the formulaic plotting and over-stylization that makes so many other films tired, boring, and bereft of fun. If indeed, the first film was a welcome makeover, than this was needless plastic surgery, of the decidedly botched kind. [i] I personally label this The Joel Schumacher Effect. 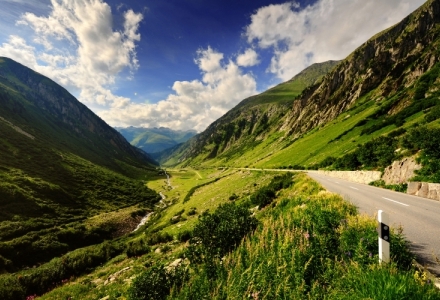 [ii] And after A Quantum of Solace, you can say that all over again. Posted on December 30, 2011, in The Antiscribe Appraisals (Reviews) and tagged game of shadows, guy ritchie, moriarty, napace, robert downey, sherlock holmes, watson. Bookmark the permalink. Leave a comment.